Why is the bread lost, when it appears to be right there on the cutting board? Simply because the dish is best made with stale bread, yesterday's bread (or the day-before-yesterday's bread), the bread that would be thrown out if it weren't for the clever idea of softening it up with some custard, sweetening it, and frying it into a treat. It's the same idea as bread pudding, and, as with bread pudding, for the French, their pain perdu is usually served as a dessert. So, if the waiter in my aunt's hotel had understood what she wanted, he would still have been mystified as to why she was ordering it for breakfast (what will those Americans do next? Eat breakfast of cakes made in a pan?). Practical tip: When you have a loaf of rock hard bread that's so lost you can't even cut through it, simply wet the outside (run it quickly under the faucet) and microwave it briefly (maybe 15-60 seconds, depending on the size of it). For a short while, it will be soft and easy to cut into slices or cubes, to be used immediately or frozen for future French toasts and bread puddings in plastic baggies. This trick will not however magically revive the bread, as once it cools down all the way, it just gets rock hard again. We Americans like our French toast with maple syrup (syrop d'érable) or powdered sugar, as if those are perfectly healthy breakfast foods. In a rare show of cross-the-channel harmony, French toast is often served, in France, with crème anglaise, or sweet English cream. Often it is served with fresh fruit, and perhaps even a dollop of crème fraîche. Sometimes what makes it dessert-y is richer custard, replacing the milk we Americans use when we make it for breakfast with cream or crème fraîche. But much of the French pain perdu is made with regular milk, so what makes it dessert is simply that the French eat it after their meal -- wisely concluding that something sweet that is custardy, bready, and creamy is dessert indeed. When you find a great lost bread in France, it's worth going back again and again. One of our favorites is at the St. Regis café on Ile St. Louis in the heart of Paris, decadently served with berries and much bigger than any one person needs. Raclette Fumée is a pretty self-explanatory cheese: it's a smoked version of a cheese made for Raclette -- the mountain-region dish in which you scrape cheese as it melts onto meat, potatoes, and stale bread cubes (and, if you're American and like some veggies with your dinner, maybe even the occasional, sacrilegious piece of broccoli). It's the same idea as a fondue except that instead of bringing your stuff into your oozy cheese, you're bringing your oozy cheese onto your stuff. 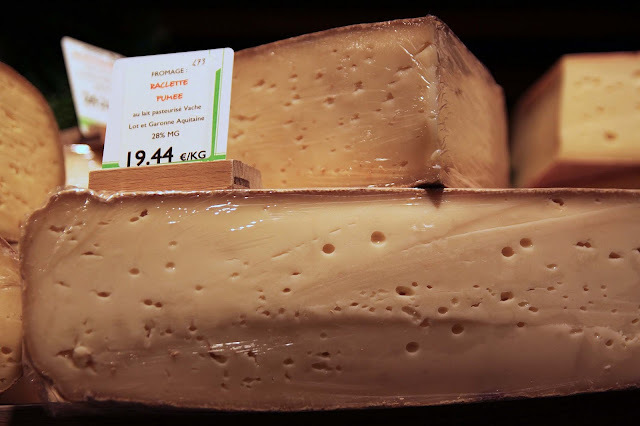 Raclette is, as a rule, made of cows' milk, and this particular one is pasteurized. And while many associate Raclette with the Alps, this one is from the department of Lot et Garonne in the region of Nouvelle-Aquitaine, in the southwest quadrant of the country. It's not too far from the Pyrénées, but you couldn't really call this a mountain-made cheese, though it certainly tastes like a day of skiing to me. Is it edible cold and plain? Sure, but I'm not sure why you would "ed" it cold. It's meant to be melted, and I prefer it that way. It does not turn into liquid, like some fake nacho Velveeta dip. Rather, it melts into a thick, oozy mass that almost holds its shape. The taste, as you would expect from something called "fumée" is smoky, like a mellow campfire somewhere in the distance. Whiat is a Raclette for if not a way to use up stale bread -- by smothering it (along with meat and potatoes) in melted cheese? However, I wouldn't put Raclette on my French toast, or rather pain perdu, and especially not if it was Fumée like this one. Some folks didn't get serious the work of essay writing and that they can write essay by o their own self and this essay won't take any smart review for them as a result of this essay isn't incorrect type or form, therefore for edubiride writing essays you ought to have to be compelled to be a lot of smart and talent full therefore you'll be able to write the most effective essay for you.